Serve the Lord with Gladness - Days of Reflection for All Ministries. Ushaw College, Durham on Saturday 4 May 2019 from 10.30am - 3.30pm (registration and refreshments from 9.45am). A light lunch will be provided. Led by Fr. Mark Millward, Dean of the Benedict Partnership. On Thursday 9 May 2019 from 5.00pm: Paper and Discussion (6.30pm: Drinks) in Pemberton Lecture Room PG20, Palace Green, Durham City. See poster for full details. Register at eventbrite or contact us on 0191 334 1656. The Mass for Justice, Peace and the Celebration of Creation will be held on Saturday 11 May 2019 from 10.00am at St. Mary's Cathedral, Newcastle. The celebrant is Mgr. Andrew Faley and the Homily read by Fr. Chris Hughes. All are welcome! See poster for details. Following Mass, the AGM and Day Conference will be held from 11.00am to 3.15pm at the Mercy Hub, St. Mary’s Cathedral. See poster or visit the Justice and Peace page for full details. Please bring your own packed lunch (there is also the cathedral cafe). All welcome! The Annual Mass celebrating Marriage and Family Life will be held on Saturday 18 May 2019 at St. Mary's Cathedral, Newcastle. Mass will be celebrated by Bishop Robert Byrne from 11.00am. Further information is available from Deacon Rob Wareing, Diocesan Marriage and Family Life Co-ordinator by email or tel: 07841 530991. Newcastle Upon Tyne NE7 7PE. Booking is essential, online at eventbrite or tel: 0191 243 3302. Refreshment and lunch donation £10.00. Lecture by Professor Alison Shell (UCL), 'Staging Magic in English Catholic College Drama'. Tuesday 21 May 2019 at Ushaw College. Drinks Reception at 5.30pm in the Refectory. Lecture: 6.00pm - 7.15pm in the Exhibition Hall. Registration is essential. See poster for full details. Is being held on the weekend of Friday 31 May to Sunday 2 June 2019. Curated by James Parsons. 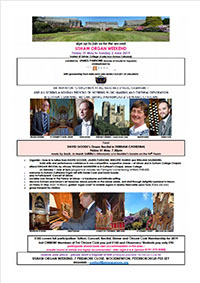 An invitation to organists at all ages and stages, observers - and all seeking a holiday weekend of inspiring music-making and cultural exploration in Durham's stunning, historic setting and Newcastle's dynamic cityscape. Hear David Goode's organ recital in Durham Cathedral on Friday 31 May at 7.30pm with music by Bach, Jo Marsh's 'Ottomania' and Reubke's 'Sonata on the 94th Psalm'. To reserve your place and all other enquiries email contact@jamesparsons.org. See poster for full itinery and cost. Apostleship of the Sea - Annual Holy Island Pilgrimage. A day of prayer & pilgrimage to the Holy Island of Lindisfarne on Saturday 8 June 2019 led by the Rt. Rev. Paul Mason, AoS Bishop Promoter, England & Wales. Wednesday 12 June 2019 Durham University. Supported by The Newman Association. This day conference is a chance for postgraduate students and other early career researchers to meet and to present their research in a collegial environment. Registration; Durham University students and staff are free of charge, others cost is £15 per person (reduced from £25 as a result of the support of the Newman Association). £15 includes registration, buffet lunch, morning and afternoon refreshments, and 4.30pm drinks reception. Registration is essential; please register online through eventbrite by 8 May. See poster for full details. St. Joseph Parish Hall, Gateshead on Saturday 15 June 2019 from 10.30am - 3.30pm (registration and refreshments from 9.45). Please bring a packed lunch. Led by Veronica Murphy from the Archdiocese of Liverpool. Lecture by Dr. Elizabeth Biggs, 'Bishop Cuthbert Tunstall and Durham’s Response to the Reformation'. Tuesday 18 June 2019 at Ushaw College. Drinks Reception at 5.30pm in the Refectory. Lecture: 6.00pm - 7.15pm in the Exhibition Hall. Registration is essential via eventbrite. See poster for full details. Joint Christian / Muslim visit to ‘Pray for Peace’. An event for Women and Young Children only. Is being held at St. Mary's Chapel, Reid Park Road, Jesmond, Newcastle upon Tyne on Saturday 29 June 2019 from 2.30pm. Tuesday 17 - Thursday 19 September 2019 in Durham. Registration; Conferences packages available from £65.50 standard rate / £42.50 student rate. More information and registration online through our conferences page. Registration deadline is Friday 16 August. Please direct any queries to the Centre for Catholic Studies by email or on 0191 334 1656. See poster for full details. An International Conference hosted by the Centre for Catholic Studies in partnership with the Capuchin Franciscans of Great Britain. Assessing the Continuing Significance of St. Francis and Franciscan Traditions of Theology, Spirituality and Action. A Conference in Honour of the 800th Anniversary of St Francis’ Meeting with Sultan Malek Al-Kamil on Tuesday 5 - Thursday 7 November 2019 in Durham. More information and registration online will be available shortly through our conferences page. Deadline for registration is Sunday 13 October 2019. Centre for Catholic Studies email: ccs.admin@durham.ac.uk or tel: 0191 334 1656. See poster for full details. Saturday 27 April 2019 from 2.00pm at Ushaw Historic House, Chapel and Gardens. Lecture by Prof. John McGreevy (University of Notre Dame), 'Jacques Maritain, Democratic Crisis, and the Promise and Peril of a Global Catholic History'. Tuesday 30 April 2019 at Ushaw College. Drinks Reception at 5.30pm in the Refectory. Lecture 6.00pm - 7.15pm in the Exhibition Hall.